Picture the peace of mind from your ventilated space maintaining the right temperature. The Quiet Inline Fans covered in this list will get you just that. They’re a subtle, silent solution to keeping a space well ventilated and at the perfect temperature. They’ll help circulate fresh air, give your heating/cooling a boost, or just exhaust small workspaces when you’re busy on the latest project. There are a few top options out there to choose from. I’ve put this quick guide together to help you find the perfect inline fan for your space. Not sure exactly what you need? Check out the quick Buyer’s Guide I’ve included after the reviews. Stuck with a loud inline fan? If you’re shopping for a ‘quiet’ fan because yours is too loud, then maybe I can save you a bit of money. There are quite a few simple ‘DIY’ ways to help reduce the noise from an inline fan. Place the fan in a box (cardboard or otherwise). Hang the fan instead of having it on the ground/table to prevent vibration. Make use of insulated ducting like this one from ThermaFlo. Use ‘Neoprene’ duct clamps which dampens vibration. Apply a duct silencer (acts like the silencer on a gun). Don’t already have a fan? Don’t worry! Not all fans are as loud as the beast he’s got in that video. Especially not the ones on this list. With multiple duct sizes, I’ve focused on recommending ‘ranges’ of models that come in different shapes and sizes. The reviews are based on 6” ducts as these are the most common. Let’s dive into the top ranges of the quietest inline duct booster fans! If you’re looking for fans based on pure quietness, my top recommendation is Terrabloom’s Silent Inline Duct Fans. Don’t get me wrong, these fans are UGLY. They’re straight out of a spaceship in a 90’s sci-fi movie. But they work. The reason they’re so bulky is an insulated, heavy metal exterior that’s lined with 2 inches of wool. This gives not just insulation against noise, but thermal insulation too. The build quality on these things is solid. Each 14lb unit is German-designed and German-made. This is backed by a full 2-year warranty with great customer support. Though I’d forget the 2 years, I expect one of these to still be running when my grandkids have grandkids! The only downside, aside from the looks, is the controls. They vary for both temperature and fan speed, but they’re stuck on the top of the unit. It can be a bit of a hassle changing them if the fan’s in a tricky location, compared to a remote controlled unit. 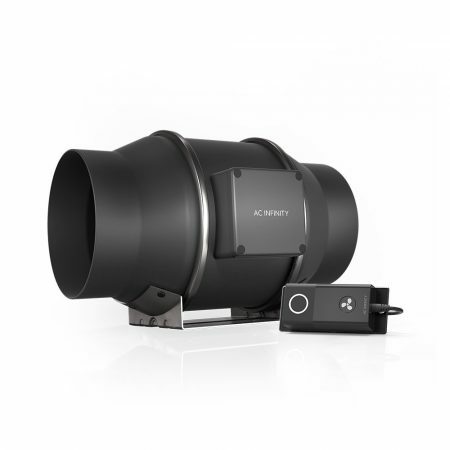 Terrabloom’s Silent Range is available in 6″ (327CFM) and 8″ (473) duct sizes. The top dog when it comes to silence. Forget modern looks or remote controls, these inline fans are made to do one thing: not produce noise. They should also last forever, too. If a quiet space is what you’re after, I’ve got no hesitation in recommending these Silent Terrabloom units as the best option on the market. However, if you’d like something a bit more modern and user-friendly, check out the models below. There’s a lot to talk about with AC Infinity’s CLOUDLINE. 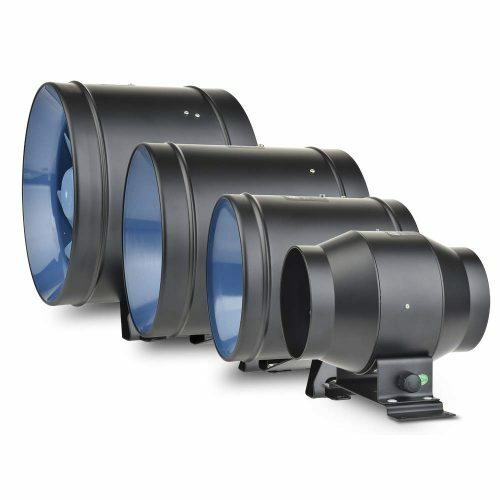 Not only do these fans look state-of-the-art, are very quiet, and pack plenty of power, but they also make use of energy-saving PWM and come with an optional intelligent controller. PWM = Pulse Width Modulation. It saves power by splitting the power into different parts by switching DC voltage on and off quickly to get what it needs. 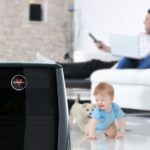 This means it uses less power and is quieter than a standard always-on AC motor. Helps to run smoothly at low speeds without creating extra heat/noise due to wasted energy. Basically, this controller can be programmed to adjust the fan speed based on temperatures or humidity. Or, for certain uses, it can be set to run only at certain times. There are models with and without this controller. The model ‘S’ (speed) doesn’t have one, the model ‘T’ (thermostat) does. Expect to save around 20% on cost for the basic ‘S’ type. Instead of the intelligent controller, you only get a basic speed control. I’d recommend the intelligent controller if you have a space that needs to be guaranteed at a certain humidity/temperature while you’re not there. Basic ‘S’ models are fine if you’re only going to be using it for your own comfort and want to get good value for money. 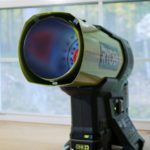 The intelligent controller’s sensors are included in a 12-foot Corded Thermal Probe. These models are a fantastic solution and I’d class them as a “best overall” product for quiet inline fans. As long as you don’t mind the price tag, you really can’t get much better in terms of a well-rounded product than this Cloudline range. The intelligent controller ensures the right temperature for your space which is great for peace of mind. These models are an ideal product, backed up with 2 year warranties and are #1 rated on Amazon’s reviews. Not to mention they look badass, too. 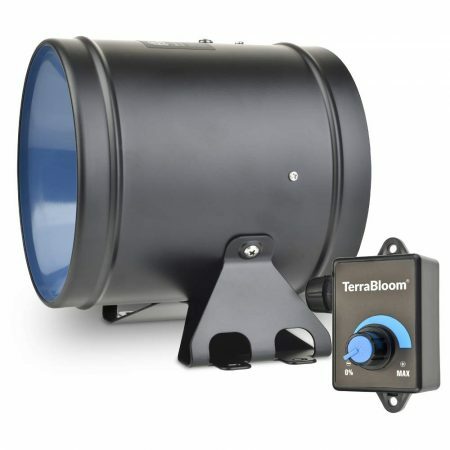 Alternative/Great Value Models: Terrabloom Inline Fans. In addition to their super-quiet models at the top of this list, Terrabloom also have this great all-rounder range of inline fans. These are a great balance of all categories. They look great, but not quite as modern as the Cloudline range. They’re not super cheap, but cost less than the Cloudline/Terrabloom Silents. Their controls are on a cord, but not remote/intelligent like the cloudline. Cover all duct/power ranges, including a model for 10” ducts with a whopping 1065CFM. The last point is a key one. If you’re in need of huge amounts of power this range has the greatest CFM with the 10” model. Hurricane levels of wind power! If quietness isn’t more important to you than price, looks, or power, then these models could be a great fit for your space. They have everything without going overboard. For a fair price you’re getting a good looking, reliable inline fan which won’t sound like a jet engine or break the bank. That said, they aren’t breaking records in any of these categories, either. 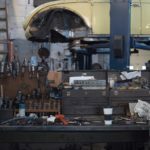 A jack all of trades that remains a great option. 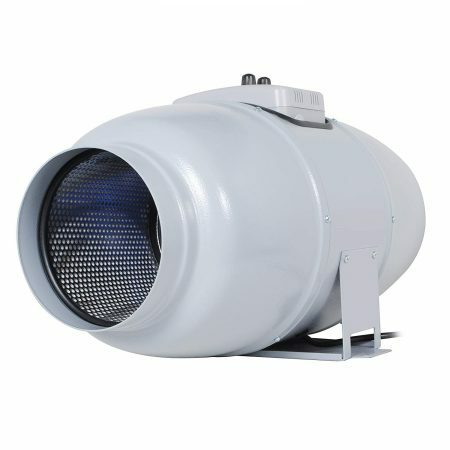 This Inline Duct Fan by iPower is the perfect example of a bang for your buck bargain. Forget good looks, easy controls, big brand names. If all you’re looking for is a basic inline fan that you can set up and use, this could be the one for you. What you lose out on the new-age features of the top models you keep in your wallet. With a price tag of below half of the flagship ranges, sometimes you can’t go wrong with a basic great value get-the-job-done model. There’s not much more to be said for this one. It’s cheap, cheerful, and will get the job done. Your space might not be controllable to a dead-on temperature, but you’ll get yourself a decent, working fan while keeping the bank balance a bit more buff. Power. Defined in CFM (cubic feet per minute), this should roughly equal the cubic feet (heightxwidthxbreadth) of your space. Add around 10% more if you’re cooling a room that has direct sunlight or hot summers, or heating a room that’s quite drafty, etc. Placement. Is the fan going to be visible? If so, it might be worth getting one that looks good. If not, focus on function not form. Is it going to be easy to reach the controls? Do you need a remote-control or can you easily change dials that will be on the fan? Reliability. Is this a small project, or will you need peace of mind that the fan will last for years? If so, look for a great (2-year+) warranty. Quietness. Just how quiet does it need to be? If so, be prepared to not only get one of these super quiet models, but also use the tips in the introduction to help reduce noise further. 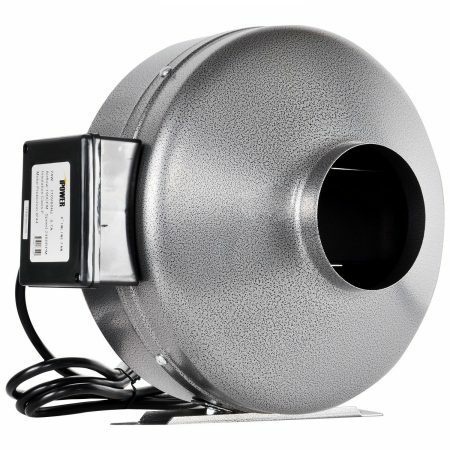 Inline duct fans are a must for any small space you want to keep fresh or at a constant temperature. These quiet models mean you can have that peace of mind without the WHIRR of a loud fan. Grab one of our top recommendations, along with the tips outlined in the introduction, and you’ll have a fan so quiet you could sleep next to it!